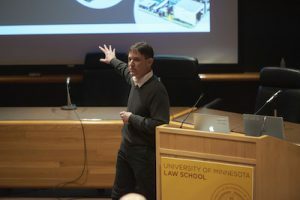 I had the extreme pleasure of recently keynoting the University of Minnesota’s Law School’s Symposium on the Internet of Things. During the opening remarks and the lunch keynote that I gave to the audience, I talked about the way in which intelligent “things” are more and more going to have an impact on our lives. While Amazon Echo and Google Home are products that come to mind to most consumers, there are a whole host of products that we collectively at Lab 651 have worked on that fundamentally solve problems in unique ways using intelligence devices to drive business value or improve the quality of life. Some of which include Wildflower Schools, Vitals Aware Services, and Eaton Corporation. One of the metrics that I like to share when I present on the Internet of Things is this Google Trends chart. 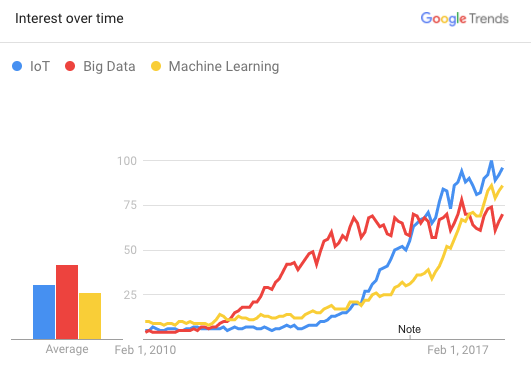 I especially like this chart as it shows the popularity since 2010 of three different, but related technologies ( Big Data, Internet of Things and Machine Learning ). In isolation, the growth over time of each of these is neat to see, but combined together it creates a force multiplier to the value of what IoT technology can bring to the world today. The reality is that we needed the advancement of Big Data for training the system, IoT for the devices themselves, and Machine Learning as the intelligence to take action. It’s with these technologies that Lab 651 has continued to create unique IoT solutions for our customers. Thank you again to Dean Jenkins of the University of Minnesota Law School, Daniel Green, the editor of the Law School Journal, and everyone who attended. You all put on an amazing event that I was blessed to have been the keynote presenter. I do presentations on topics like this all the time. We can tailor one to your organization. Please reach out to myself or the team at Lab 651 and we will be more than happy to learn more about the problems your business is trying to solve while helping you explore solutions using IoT technologies.